Jordan Burrow fires a double as Gateshead win 2-0 at Leyton Orient for their first victory under manager Steve Watson. Hartlepool have to settle for a 1-1 home draw for the second successive National League game, this time against Tranmere. We'll leave you with this image of a pink cast to the sky over Tynemouth last night - if you'd like to get in touch or share your North East pictures with us, you can do so on Twitter, Facebook, or via email. We'll be back tomorrow from 08:00, have a good evening. There was plenty of glitz and glamour on display at FIFA's awards ceremony in London last night. However, the gala also took time to to reflect on the more human side of the sport, which included a tribute to young Sunderland fan Bradley Lowery. The six-year-old from Blackhall Colliery died in July after a battle against neuroblastoma. 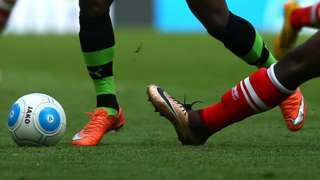 He had been the club's mascot and was "best mates" with his hero, former Black Cats striker Jermain Defoe. The leader of Redcar and Cleveland Council has said that the redevelopment of the former SSI site is more likely to be "piece by piece", than a "big bang". More than 4,000 people lost their jobs when the firm collapsed in October 2015. Last week the South Tees Development Corporation (STDC) announced a 25-year plan to regenerate the site, and the area around it. Council leader Sue Jeffrey, who is also on the STDC board, said: "The way that site will be developed won't necessarily be a big bang. "If we wait for everything to come together at once then we could be waiting forever, and we want to see stuff happening quicker than that. "So we'll do it piece by piece, and if that means we have to do individual deals with the receiver to release land on a case-by-case basis to encourage investment then that's what we will do." It will become generally cloudy overnight, with outbreaks of rain likely, and heavier bursts possible over the hills. This will clear south east during the early hours of Wednesday. A1(M) County Durham southbound severe accident, between J63 for A167 and J62 for A690. A1(M) County Durham - A1(M) partially blocked and queuing traffic southbound between J63, A167 (Chester-le-Street) and J62, A690 (Carrville), because of an accident involving three vehicles. 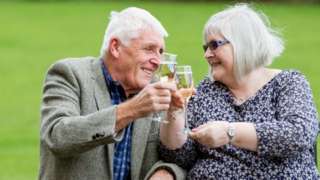 The 68-year-old shared a £25m prize in the Lotto draw by matching five numbers and the bonus ball. A free "people-powered" newspaper is set to launch in the North East. Founders of The Eclipse said ordinary newspaper readers would investigate, write and produce the content alongside trained journalists and ex-newspaper staff. Jessie Joe Jacobs, co-founder and former boss of the Stockton charity A Way Out, said: “Running a charity that worked with some of the most vulnerable people in society, I was often left outraged by the way the tabloids portrayed the type of people we were working with. 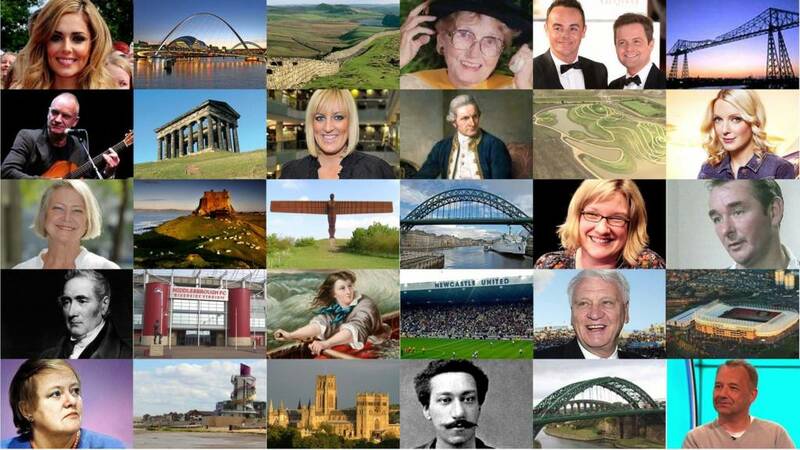 Launched on Friday, it will be delivered to 10,000 people across Newcastle, Gateshead and South Shields. Newcastle University has said it will not be responding to a letter requesting the names of professors who teach courses on Brexit. Chris Heaton-Harris, the Conservative MP for Daventry, wrote to university vice-chancellors at the start of this month asking for the names of professors "involved in the teaching of European affairs, with particular reference to Brexit", the Guardian has revealed. Among those criticising the move is Professor Thom Brooks, Dean of Durham Law School at Durham University. He said: "If you are trying to find out the names of people who are involved in the teaching of stuff, well then that suggests that there's something, some possible threat to academic freedom." Mr Heaton-Harris said he believed in an "open debate" about Brexit. A letter from Mr Heaton-Harris MP was sent to our Vice Chancellor and we will not be responding to it." The cash - which included £2.8m from the Department for Transport - will be used to upgrade traffic signals with Automatic Number Plate Recognition cameras, variable message signs and integration with public transport data. The new technology means the cameras can be monitored from the regional Urban Traffic Management Centre, allowing officers to adjust signal timings where necessary to improve traffic flow. This new investment means we can connect up traffic signals across key routes so we can smooth our traffic flows where we see congestion building up and adjust traffic signals right across the network to keep traffic moving at peak periods." Police investigating a bogus caller incident in South Shields have released an image of two men they would like to trace. It follows an elderly resident of Tadema Road resident being duped into signing a contract for roof repairs that were not necessary. Northumbria Police said it is keen to speak to these two men as its believed they were in the area at the time on 5 October. Youngsters in Newcastle are still putting themselves at risk by using a derelict Greggs factory as an "adventure playground", police have said. Neighbourhood officers first issued a warning in June following reports of children trespassing at the site on Christon Road in Gosforth. Metal fences and warning signs were put up to prevent people from entering but earlier this month youngsters were spotted on the roof, throwing stones on to nearby Metro tracks before being disturbed by police. Neighbourhood Inspector Karen Murray said: "It could be a tragedy if one of those children... was to fall through the roofing but clearly they are unaware of how dangerous it is or how dangerous it is to throw rocks and debris on to the metro network. "We want to make sure that a child is not seriously injured and are working closely with the owner who has already fitted fencing around the site." 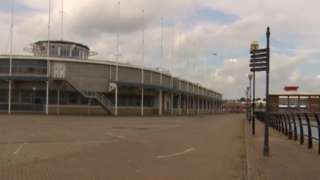 Ambitious plans to redevelop the former Jackson's Landing site at Hartlepool Marina are definitely going ahead, the council has said. There are hopes that the scheme, which includes a four-star hotel and restaurants and a family museum, developed in partnership with the National Museum for the Royal Navy, will create 400 jobs. Kevin Cranney, the council's chair of regeneration, said: "We've already received over £600,000 from the combined authority for the development stage, so we're going to have a dedicated development officer to work with partners to bring this to fruition. "We met with executives from the Museum of the Royal Navy last week and they're already talking about bringing up a ship next year to be ours on the site." And here County Durham and Darlington Fire and Rescue Service show off its latest recruit. The Jacksons Landing site is set to become a sports and leisure hub. The Tall Ships come to Sunderland next summer and on-shore events are also looking ship-shape - buoyed with cash from Arts Council England. Almost £150,000 has been awarded to support cultural events over the four days. These will range from stage programmes to street theatre. The Suffolk widow of a soldier, who took his own life last November, has been talking about the pressures veterans face when they leave the forces. Cpl Chris Small, who was originally from Colchester, had served 21 years as a chef in the Royal Logistic Corps, with tours in Iraq, Bosnia, Kosovo, Northern Ireland and Afghanistan. He had also served in Woodbridge. He took voluntary redundancy in 2014 after a final posting in Germany. His wife Mandy, who served 12 years in the RAF Police, said Chris found it difficult to adjust to civilian life, and the couple separated. He had been working at Coundon in County Durham when he took his own life, aged 44, leaving their son who was eight at the time. "In the military you're looked after, you've got a fantastic family network around you the whole time you are in, but the moment you leave through the camp gate it's all very different," said Mandy, who now works at Ipswich Hospital. Moving in to Civvy Street is one of the hardest things you'll ever do... we found it stressful and it's one of those things that will make or break you as a couple." There's a lane closed on the A194 westbound. A "wider and quicker" link road from the A19 into the heart of Sunderland is likely to be agreed by city councillors later today. The dual carriageway would run from the New Wear Crossing to St Mary's Way. Due to be completed by 2020, it is the third stage of five in a £64.1m proposed road network known as the Sunderland Strategic Transport Corridor.